The Langham just can't seem to catch a break when it comes to its flagship restaurant. Old timey readers may recall that I was there for Michael Voltaggio's last night at The Dining Room back in July 2010. His stint there didn't even last a year, and he himself was a replacement for Craig Strong, who left to head up the kitchens of Studio down in Laguna Beach. 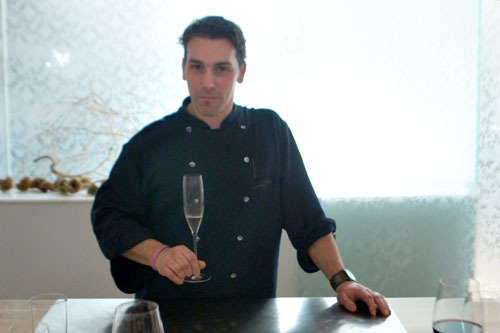 I'm sad to say that I recently closed out the tenure of another chef, the talented David Féau, during the final night of service at The Royce. Ever since my first visit to the restaurant, I'd recognized the considerable skills of Chef Féau, who has consistently turned out plate after plate of some of the finest cuisine the Southland has seen. In the back of my mind, however, I always had an inkling that the place wouldn't last. Féau's cooking had too much finesse, too much complexity for guests of the old line hotel, and denizens of Pasadena in general. It never was a great fit I suppose, and though the Chef and his staff hung on for over two years, the Langham finally pulled the plug last December. It was a surprise to me, but then again, it sort of wasn't sadly. 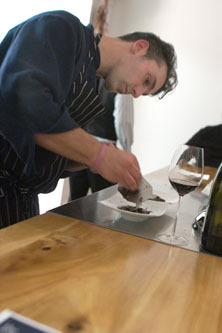 Tonight, the menu for the whole restaurant was a $150 tasting with an optional $75 wine pairing, though Féau did include a few extra courses for our party at the Chef's Table. Click for a larger version. 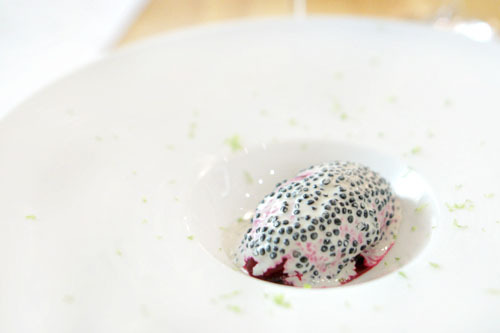 Our first course comprised a striking quenelle of beet sorbet, coated with crème fraîche, dotted with caviar, and dusted with kaffir lime. It was a masterful presentation of beet, a stimulating jolt that deftly played the inherent sugariness of the root veggie against the salty, smoky roe and sharp sourness of the lime, all while the crème fraîche served to moderate and integrate the dish. 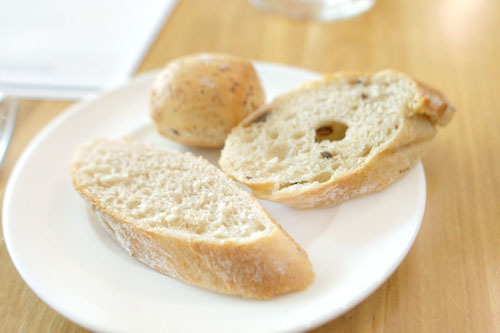 The housemade bread this evening included olive, bacon, and French baguette varieties. Our first "bonus" course was spiny lobster from nearby Santa Barbara. 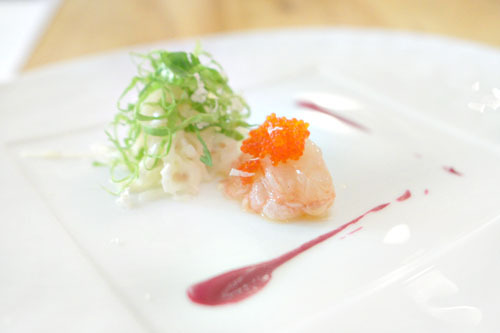 The crustacean itself was spot on: supple and snappy, with a lovely freshness to it along with a subtly sweet brine. It was superb alone, but also went well with its pairing of a reimagined remoulade, which lent a certain savory, piquant weight and slight bitterness to the dish. Lovely crunch from the daikon as well, and I appreciated the sort of overarching sesame notes here too. 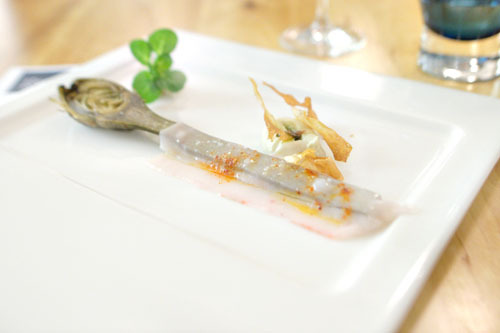 The Chef's preparation of razor clam was easily one of the best I've had. 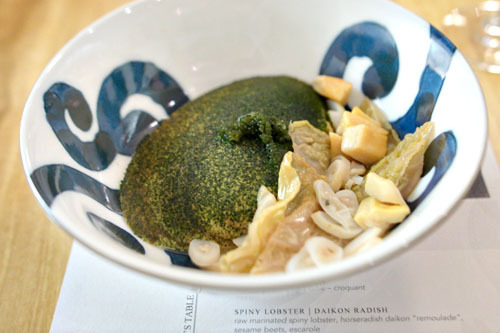 The bivalve arrived steamed to a wonderfully firm, yet tender consistency, and was just teeming with a briny goodness that was only enhanced by the heady, aromatic clam-seaweed broth. Sea lettuce powder and sea grapes provided further points of interest in the dish, but the best accoutrement here was that "kimchi," which offered up a beautiful countervailing tanginess. 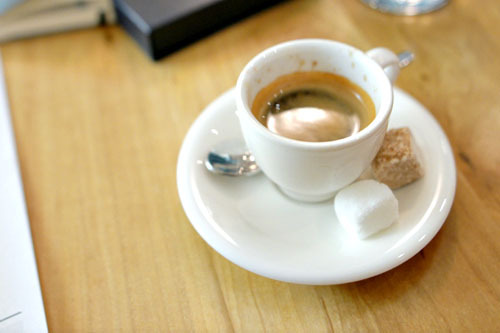 Toward the end, I eagerly supped up the remaining liquid with my bread. A "tulip" of artichoke came out looking quite handsome, grilled and draped with a veil of lardo and drizzled with espelette. The heart and stem here were certainly tender, with an earthy, vegetal flair that played off the considerable weight of the fatback, as well as the sweet-spicy flavors in the dish. 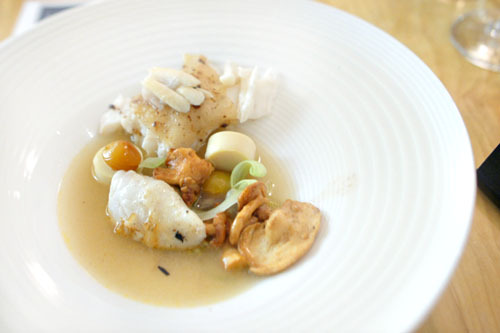 Next up was a gorgeous fillet of turbot, presented and plated tableside by Chef Féau. 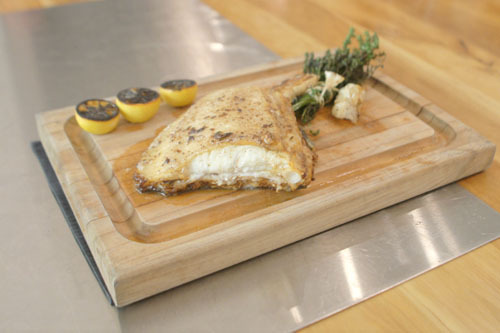 The turbot was just about perfect, with a beautiful texture (especially the cheek portion) and a refined, yet robust flavor. It was mouth-wateringly delicious alone, but the additional earthiness of the hedgehogs and lightness of the celery really made the dish sing. This just might've been the best turbot I'd ever had. In our next extra course, black mullet came out in flawless fashion, perfectly seared and just teeming with a fishy savoriness that was expertly played off of the tangy flavors of the fennel, tomatillo, and scarlet turnip. 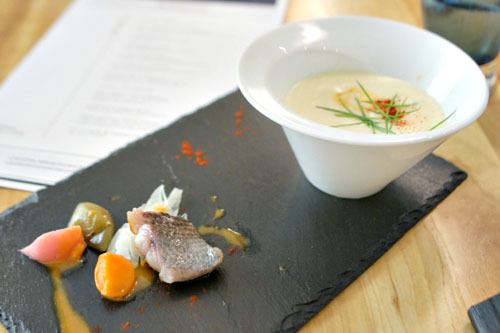 If that wasn't enough, we were also provided a potage made with fish head, shallot, and paprika, all contained under a potato espuma. The soup was something else, delivering a punch of ocean-y intensity, only slightly tempered by the potato. 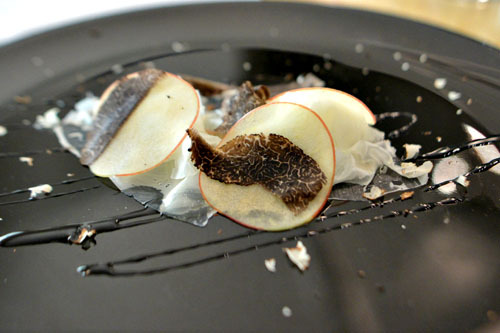 At this point, Chef Féau teased us with a trio of French black Périgord truffles placed on the table, which he then proceed to shave generously over the next course. 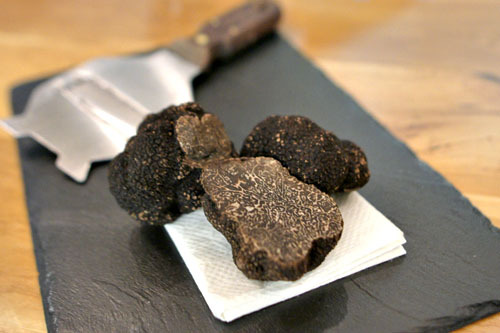 It was the height of truffle season, so the perfume on these was pretty incredible. The famed lentils from the French region of Le Puy were done proud here. 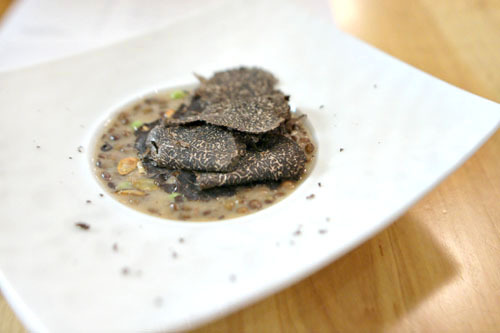 Served with pepitas, the amalgam of nutty, crunchy, and earthy sensations was beautifully set off by the amazing depth of the truffles, all while the peas added a contrasting sweetness and brightness to the course. A perfect dish--I just wanted to keep eating and eating. The first of two beef preparations was the bone marrow "tempura." It reminded me a bit of a cromesquis, and its liquid-y center was just teeming with the rich, heady flavors of the moelle osseuse. 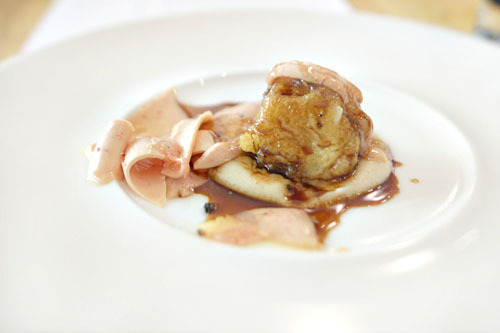 A bordelaise sauce added further interest to the fritter, while the layers of shaved foie gras actually served to lighten the dish. There was a lovely peppery finish to the course, but I would've liked something--more acidity, more bitterness--to balance out the heft of the marrow. 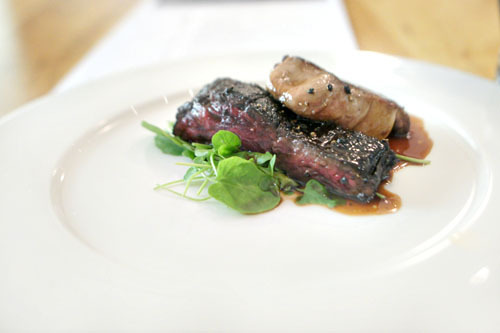 Our final savory course brought us a Rossini-inspired cut of wagyu rib eye cap with bordelaise. The steak I found expectedly tender and fatty, with a boatload of bovine goodness and a nice char bitterness, all while the included greens provided a trace of levity to things. The foie gras, meanwhile, was presented in classic fashion, well-seared, and with lovely pricks of offsetting salinity; the portion size should've been smaller though. Chef Féau has always been good about presenting some really strong, inventive cheese courses, and this dish just continued that trend. The Tomme here was dehydrated I believe, giving it a wonderfully salty, yet subdued flavor profile that paired in stellar fashion with the tart, juicy, translucent sheets of apple and sugary lines of honey, while the shavings of black truffle offered up a profound earthiness that did a great job in enveloping the entire dish. Bravo! 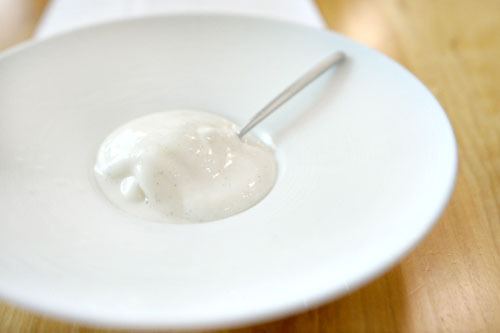 Our sort of pre-dessert was a dollop of vinegared rice pudding, set against a lemongrass milk. It was a light, refreshing smack to the palate, with the rice playing well off of the sweet, herby nuances in the dish. 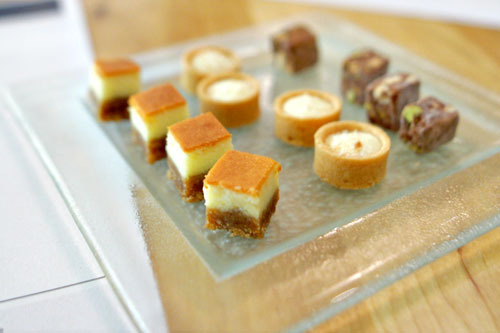 Three types of petit fours were then brought out: nutty-sweet chocolate nougats, tart 'n' savory mini key lime pies, and my favorite, the delightful cheese tarts. 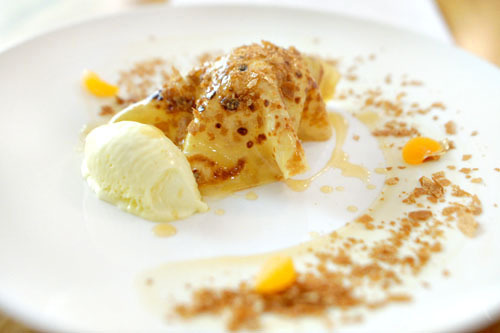 Dessert was a riff on the classic crêpe Suzette. It really did a nice job in conveying the quintessence of the traditional dish, with the sugary, boozy, and citrus notes working together here in good harmony. Lovely texture on the actual crêpe, too. I found the whole thing strangely reminiscent of an orange creamsicle! 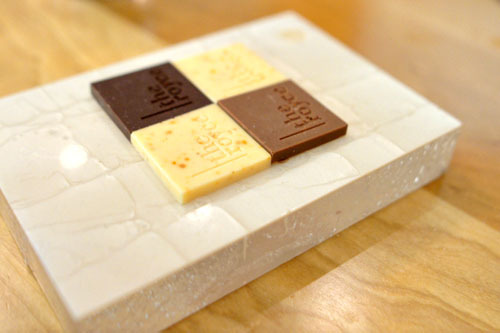 Finishing things off was The Royce's signature squares of chocolate (fleur de sel dark, espresso milk, espelette white) and a cup of espresso. By the time you read this, The Royce as we know it will be done, finished, fini. The restaurant will be revamped a bit, and will transform into a high-end steakhouse. It's not the most exciting concept, but at least it might become a candidate to take over the void left by CUT. The Royce v2.0 is slated to launch soon, in late February/early March, and I imagine I'll be there opening night in classic kevinEats fashion. What's more interesting, though, is the fate of David Feau. 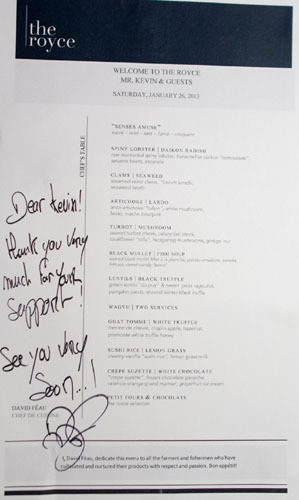 Fortunately for us, he's not done with LA yet, and is planning his next move, probably a small, intimate place connected to a retail/wholesale boutique and boulangerie in South Pasadena. It's the type of venue that I think is better suited for the Chef's style of cooking, and the shop section of the business should provide for more financial stability. Look for the boutique to come to fruition in the coming months, with the restaurant to follow sometime after. À bientôt David! No way!!! Aw....one of my finest meal in LA was served here. It's sad that they're shutting down The Royce. Now I can only dream. Sad I couldn't make it. I thought Totoraku was completely over-rated (even though the wines were awesome) and wish I ate here! Kevin, what do you mean by "the void left by CUT"? Is CUT closing? No buenos!!! P and I would have loved to joined you on this one!!! Is it really gone gone??? Any more last bites to catch?? Sam: Yeah it's too bad; maybe we can visit his new place next time you're down here. Charlie: What was the issue with Totoraku? I still think it's the best yakiniku out there, though I wouldn't exactly call it a great value. Josiah: Oh no, I just meant that my last visit to CUT wasn't quite as good as before, so it's no longer unequivocally the best steakhouse for me.